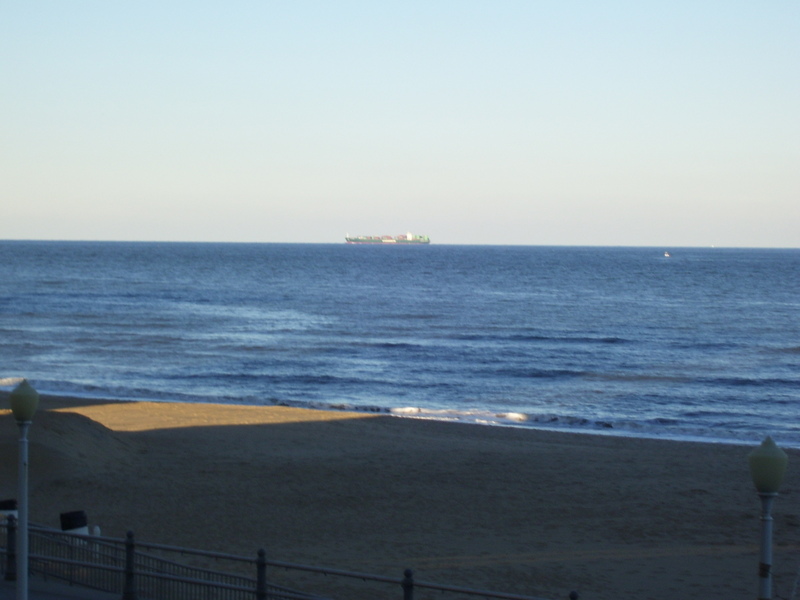 For Thanksgiving we decided to go to Virginia Beach for a couple of days. 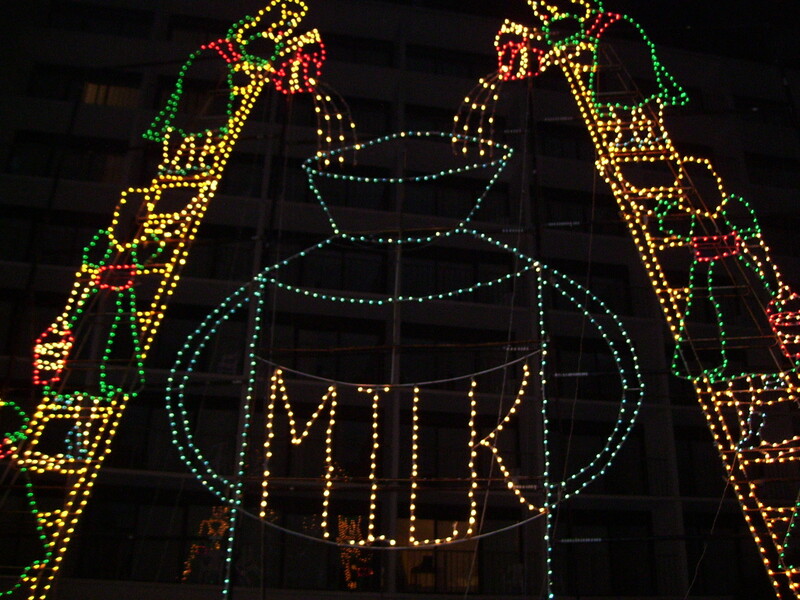 We had tossed around the idea of going to New York City and attending the Macy’s parade, but in the end I was really sick with a bronchial type infection so I wasn’t willing to spend a lot of money on a get-away that I wasn’t feeling totally up to par to enjoy. We got a pretty good deal on a hotel room at the Hampton Inn with king sized bed, balcony, and jacuzzi in the room. I scoured the internet reading customer reviews and this place seemed to be clean. A lot of places I looked at had reviews about bed bugs, etc. so cleanliness was my number one priority. And it turned out I chose very well. The room was lovely and very well kept up, no bugs of any kind in sight! 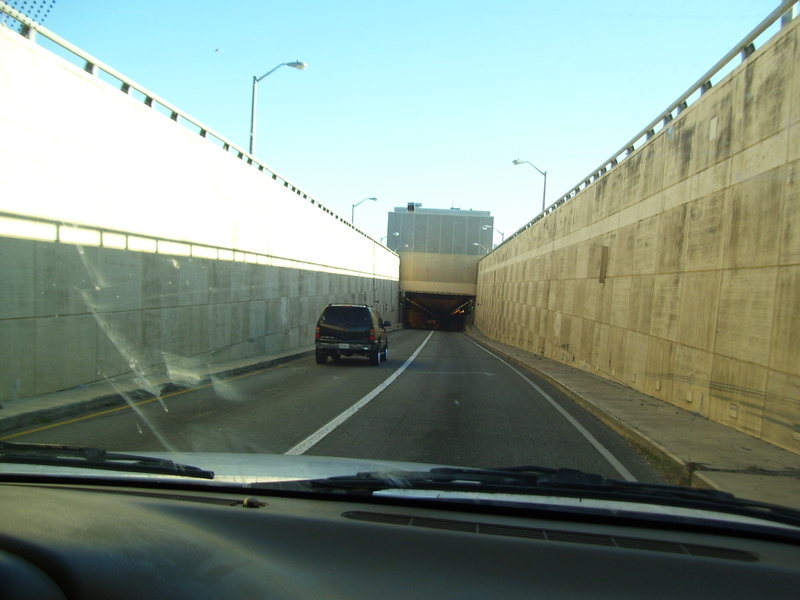 In order to get to Virginia Beach you must take one of many underwater tunnels. There are signs leading into the tunnels reminding you to check your fuel status. During rush hour you can get stuck in these tunnels for hours in bumper to bumper traffic. Luckily for us, we were travelling at an off-peak time and zipped right through. 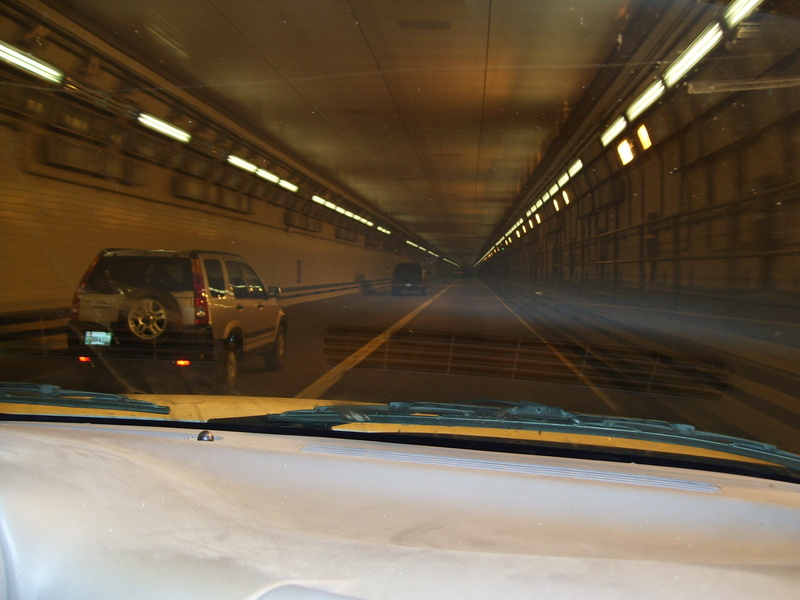 Driving through the tunnel reminded me of Montreal and the many trips I’ve made from New Brunswick to Toronto, which kind of made me homesick. 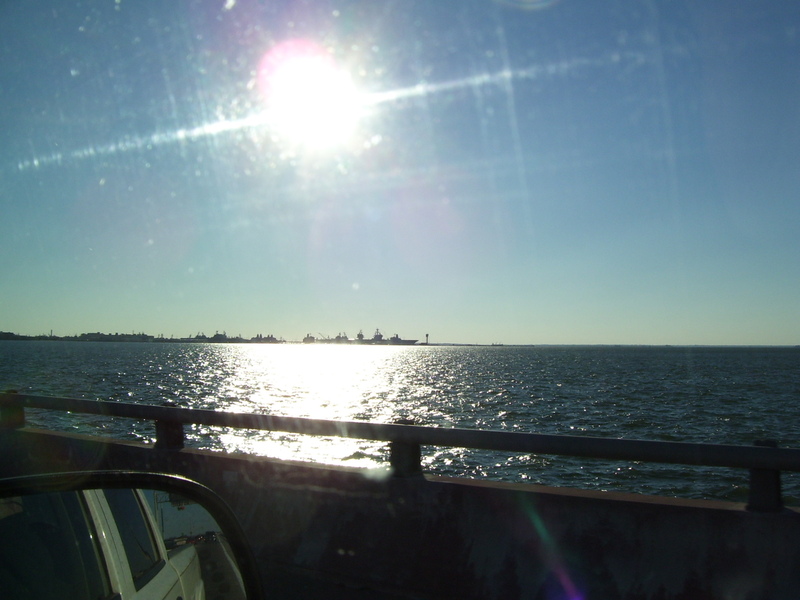 I tried to get a good shot of the numerous warships at the Norfolk naval base as we passed by, but I probably should have rolled down the window and zoomed in. 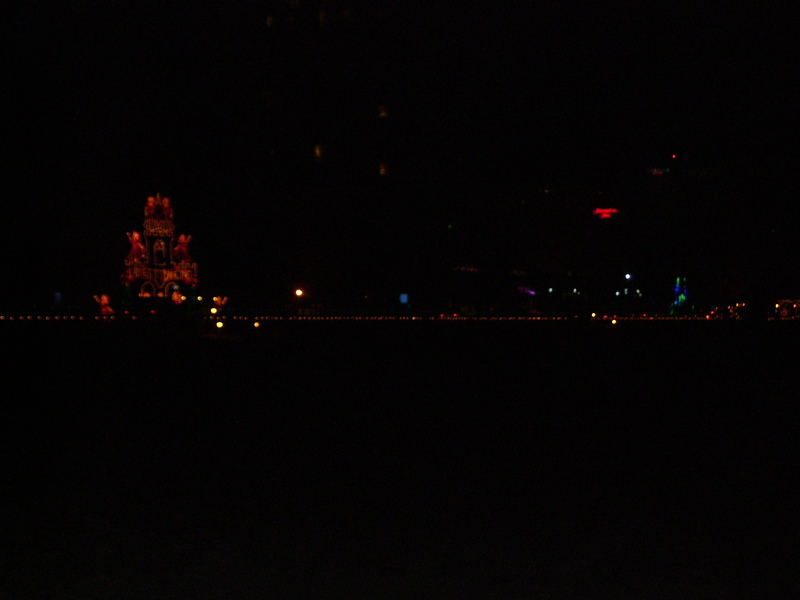 Night shot of boardwalk from our balcony. 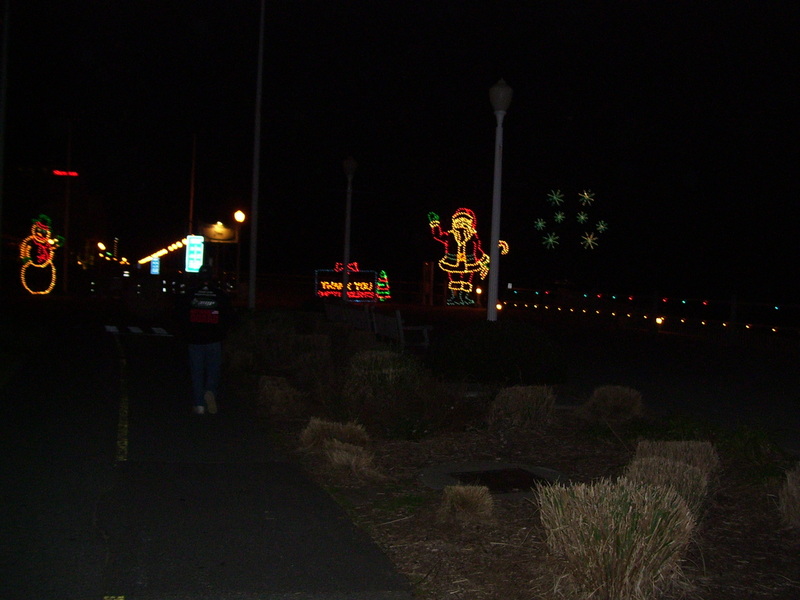 There’s a boardwalk that runs all along the beach front and for the holidays every year McDonald’s sponsors a parade of lights. 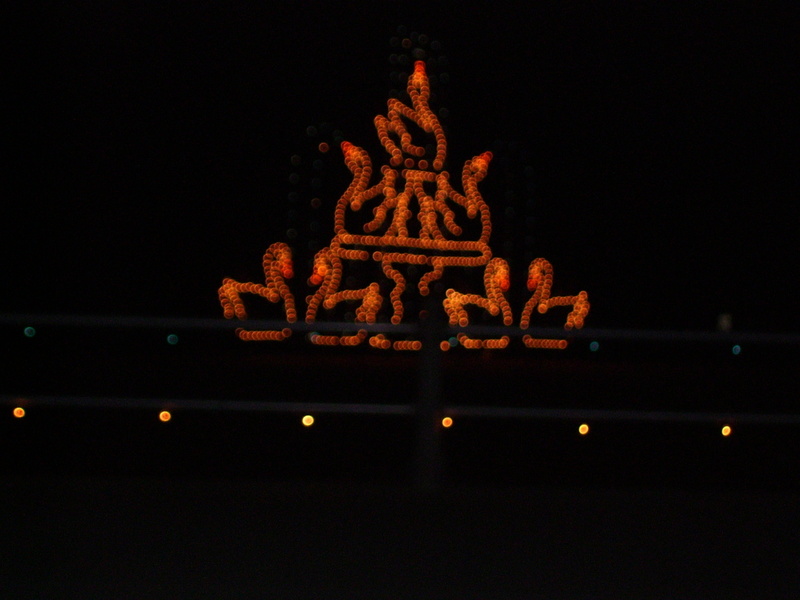 It’s the only time they open the boardwalk up to cars so people can drive through, see the lights, and take pictures. We didn’t do the drive through, but walked it for a bit one night. 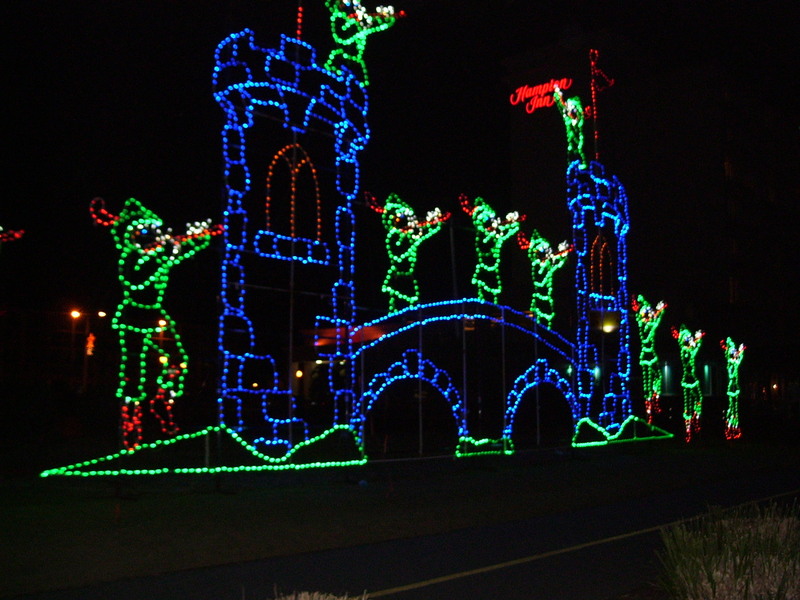 The US seems very different than Canada with regard to Christmas. 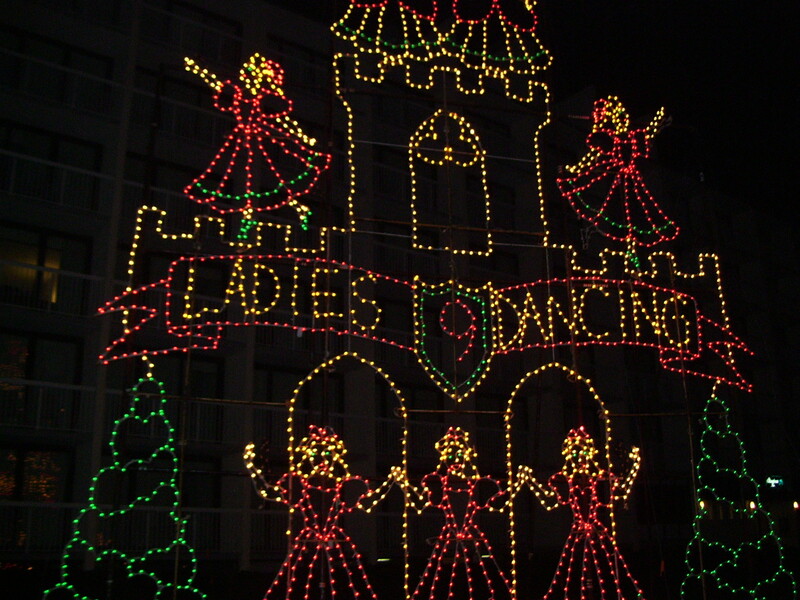 They make a much bigger deal out of Thanksgiving than December 25th. People don’t decorate their homes as much as back home and towns/cities/stores also don’t really go all out like they do in NB. 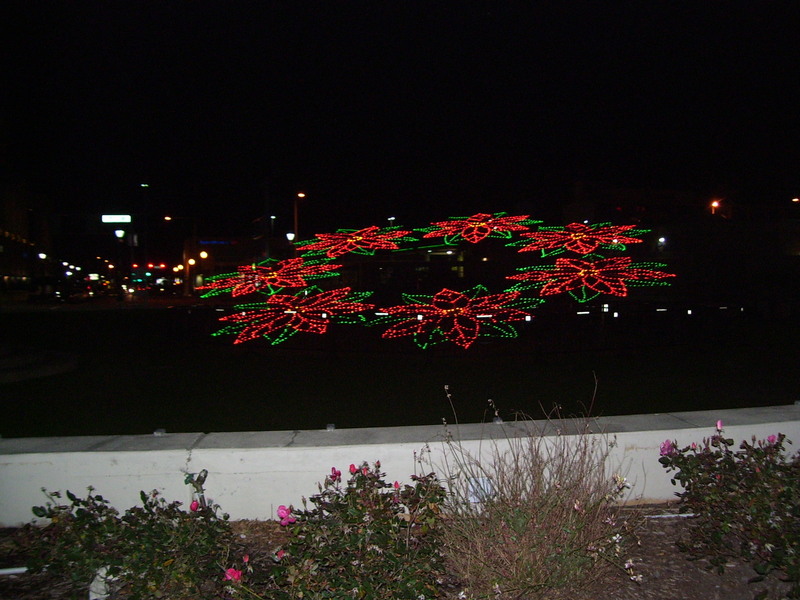 So seeing these lights was a real treat and gave me a bit of holiday spirit, albeit a bit early. Daytime view from our balcony. There were always ships passing by, coming and going into port. 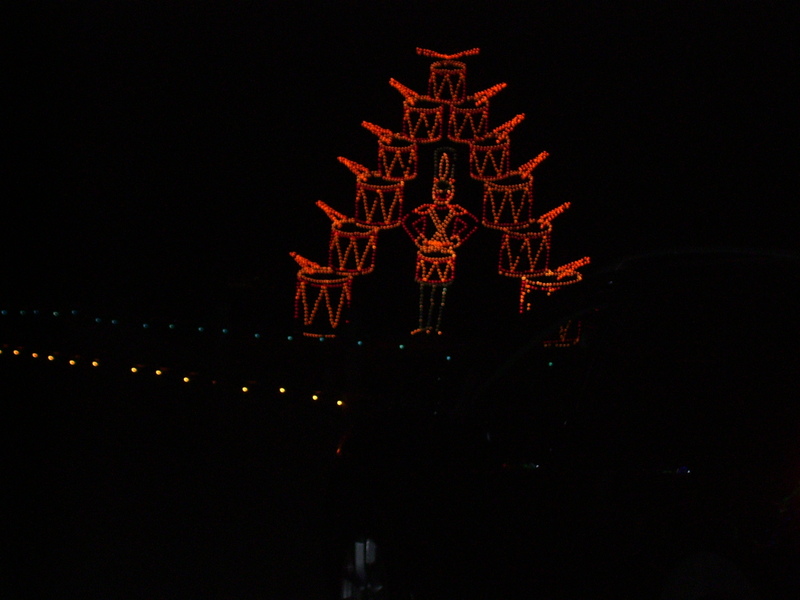 Some were cargo, but there were also a lot of cruise ships, which were wonderfully lit up at night. It was super cold while we visited, a lot of the shops and hotels were closed for the season, and as you can see there weren’t a lot of people braving the cold winds on the beach. 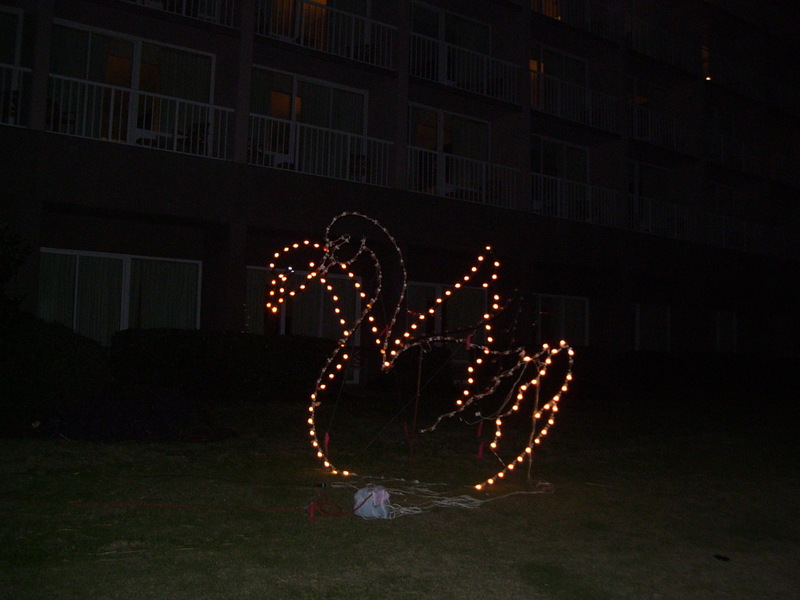 Another shot from our balcony. Our hotel was right at the northern end of the touristy part of the beach. 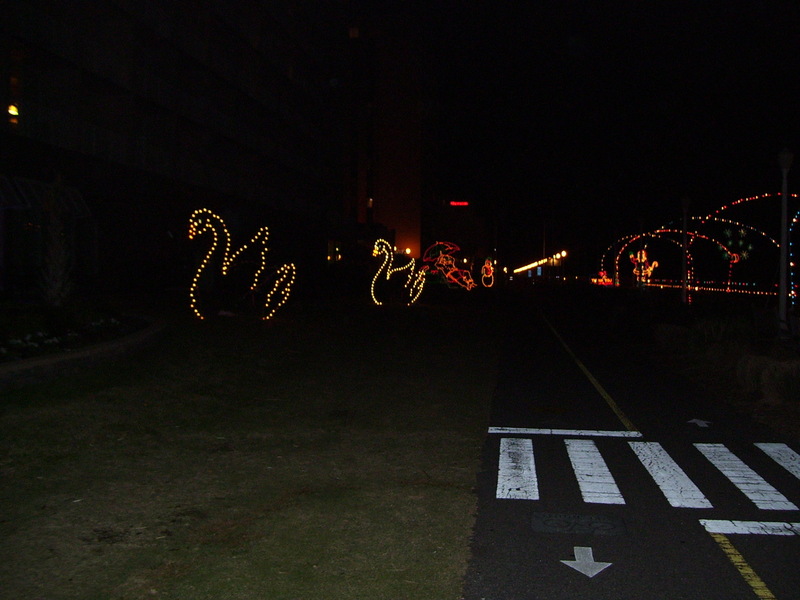 The holiday lights ended right at our hotel. This was a shot looking south toward this huge Greek statue. I forget the god’s name, but he watches over sailors. We spent a lot of time in our room because I wasn’t feeling up to snuff and the temperature was pretty low. The first night we didn’t even go out to dinner, just ordered a pizza delivered in. The jacuzzi did wonders to clear out my sinuses, so we spent a lot of time in it. The second day we walked the boardwalk and bought a couple of souvenir mugs, a Harley t-shirt etc. Then we went to dinner at a local bar/grill. Jay had to kill a huge cockroach that was crawling on the back of my side of the booth. It’s a testament to how tolerant I’ve become that I didn’t freak out at all and we stayed, ordered dinner and ate there. The food was pretty good and inexpensive. 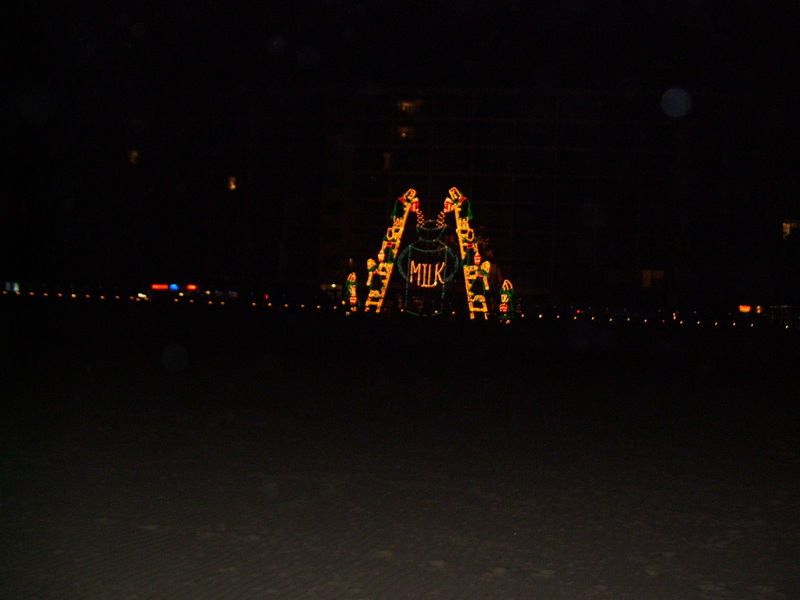 On the second night we walked the boardwalk and these are the shots of the lights that I took. 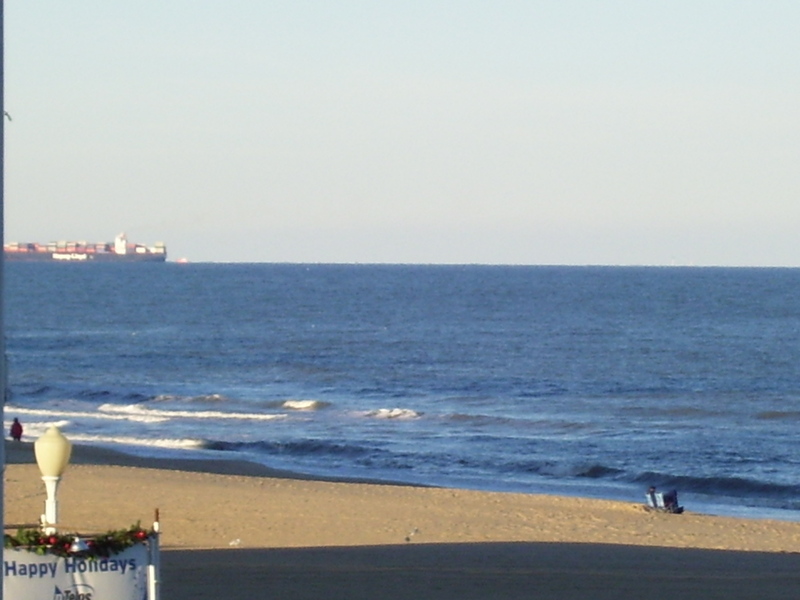 My camera batteries died and I didn’t have any extras on hand, so that was it for Virginia Beach pics. All in all we had a really nice relaxing time. I’d love to go back sometime when it’s a bit warmer. Yeah, it was like something out of a movie. I’m glad we chose to go there, it turned out to be a really good time. 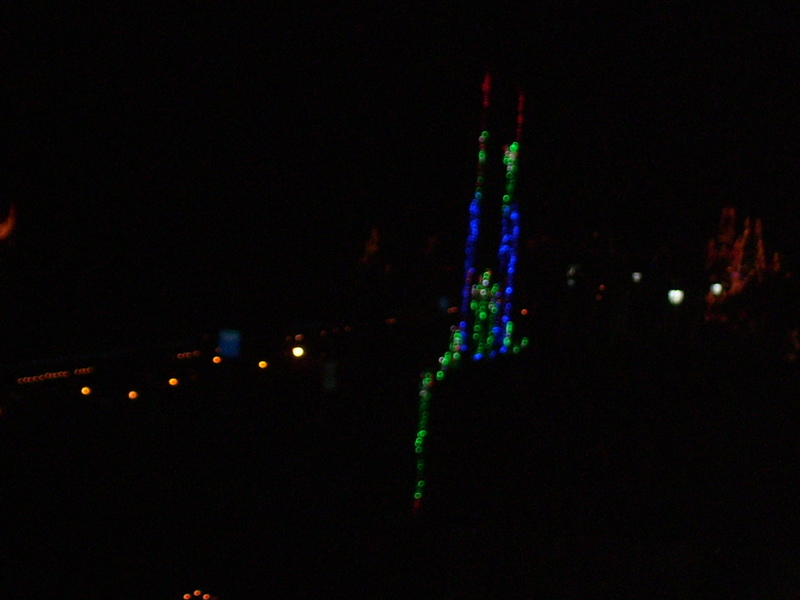 The view was awesome, tho it was crazy cold to be standing on the balcony. I think it must be really lovely earlier in the fall or spring. Summer is probably nutty with tourists. They were really something. The camera doesn’t really capture the full effect. 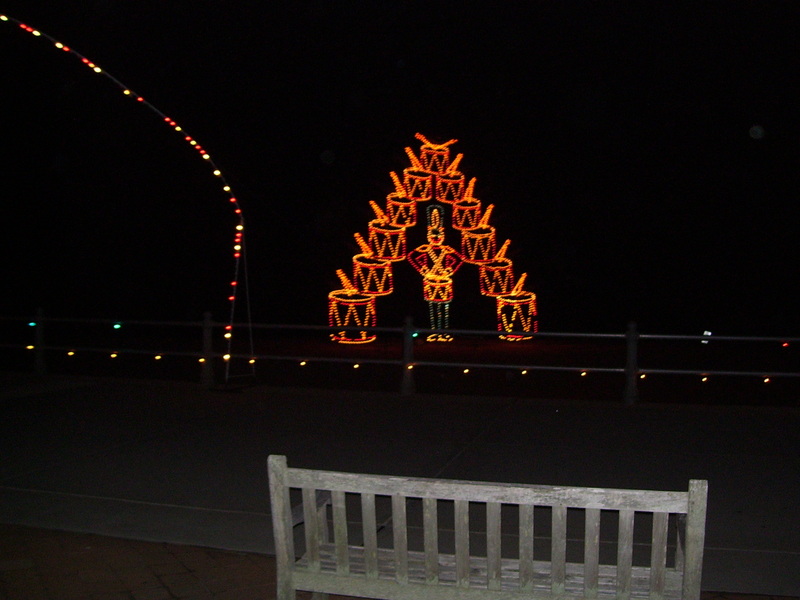 It was 25 miles of boardwalk surrounded by lights, you could see it stretching into the distance. Of course we only walked a small part of it at our end. 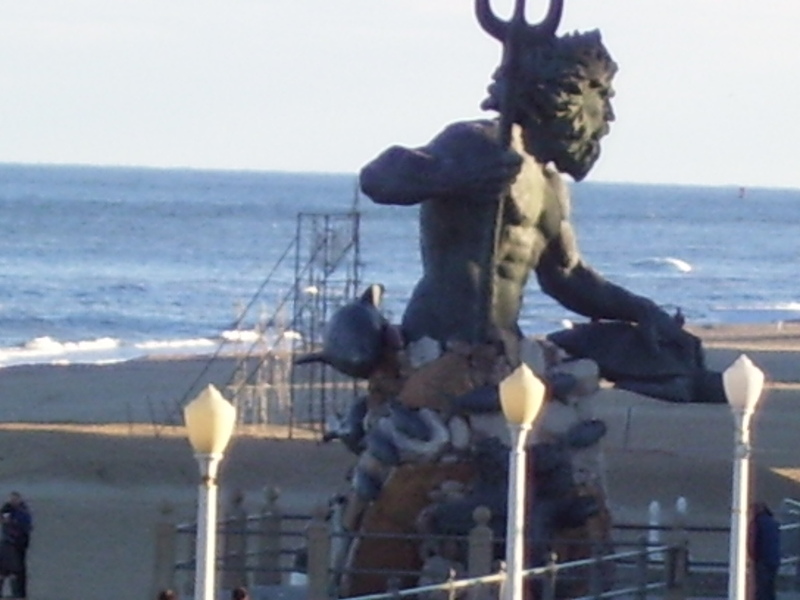 The statue looks like King Triton from the Little Mermaid. 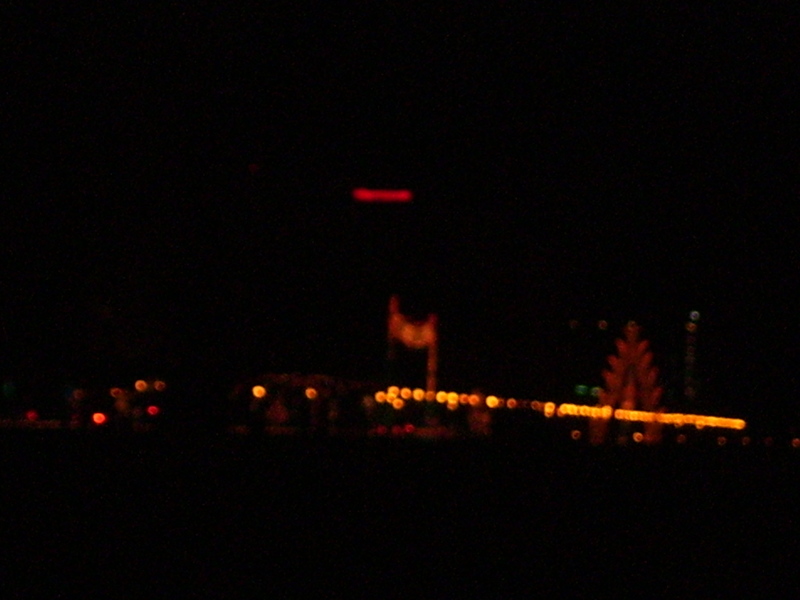 Must have been awesome to see cruise ships lit up at night. Ha! Of course it does! You would find the movie reference. It was totally awesome to see the cruise ships at night. They are freaking huge! I wondered about all the people on them and what they doing, lol.